Making sure you protect your family in case of a fire is important, but there is more to fire prevention than just having a fire alarm fitted in your home. It is important that you consider all options of a fire safety plan to ensure that you have considered all options and put your family first with fire safety at your home. 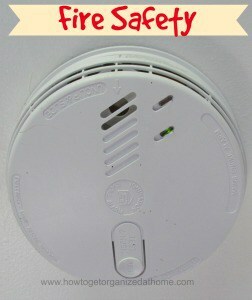 Fit a smoke detector and check that it is working correctly, change the battery yearly and know when you need to replace the complete unit. Teach children to sleep in their rooms with the door shut; this will protect them from smoke if a fire broke out. If a fire does start always touch the door before opening, if it is hot then you need to find another way out of the room, opening the door could cause a back-draft and make the fire worse. Teach your family what to do in the case of an emergency, but it is not just those family members who live with you all the time you need to advise, but any guests or visitors that you have staying in your home need to know how to get out safely in case of a fire. This includes knowing where the door keys are to the front or back door. It is just as important to protect your family from fire and know what to do to protect your home from starting a fire. Using electricity safely is important; don’t overload a socket, this can and does cause fires. Keep flammable objects away from heat sources, this includes storage heaters, they can cause flammable items to catch on fire. Don’t put clothing too close to sources of heat to dry, they can catch on fire. Don’t cook if you have drunk alcohol or taking drugs, other than prescription drugs; this is the time when most kitchen fires occur. Be careful when celebrating special events or in a holiday season, don’t leave candles lit and decorations plugged in overnight or when you leave the house. Candles are a popular item in the home now, they have scent that can make any home smell better. However, they are a fire risk and being careful where you put them and ensuring there extinguished before leaving the home or going to bed, is essential. Children are curious about fire; it is something that they seem to need to explore and doing this in a safe environment and understanding about the dangers from their perspective is important. With the use of fire pits or outside chimneys, it is a great way to talk about fire safety. When I was younger bonfires at home were the only way to be shown, but this is not an accepted form of use of fire in many parts of the country and a small fire pit can show the dangers and controlling fire in a safe way. Talking through with younger children about fire safety is important, along with the discussions with the local fire station, often this sort of activity is through schools and nurseries. Therefore, fire safety is essential and the item that made me think the most was, if family stayed would they know what to do in an emergency. There are times that you do stay with family and knowing how to react in the case of fire is important, even to the point of knowing where the keys are so you can escape if needed.